With the holiday season comes annual reviews. Therefore, I’ve been getting many calls lately about raises and bonuses. Some calls have come from employees wondering what to expect under the tree, and other calls have come from employers questioning what appropriate gifts will look like this season. If you’re an employee, you shouldn’t necessarily expect a raise or bonus. Many of my clients are making the choice to conserve money on raises and bonuses in order to keep the organization financially sound. If you get a raise, consider yourself fortunate, and remember to leave cookies and milk out for Santa as a thank you. To put all of this into context, roughly 63% of nonprofits plan to increase staff salaries this year. For those, the average base salary increase is just under 3% (2.8%). Last year it was about 2.5%. If your organization isn’t in a position to offer raises or bonuses, find a creative way to make your employees feel valued. Concert tickets, an extra day of vacation, a heart-felt note, or a dinner gathering at your house for staff won’t go unnoticed. 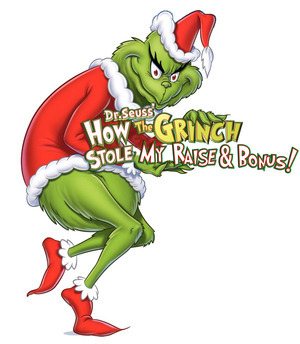 Even if the Grinch tries to steal your raise this holiday, remember the Whos in Whoville found a way to be happy anyway!